Sarah Schweiger, engineer at SRF Consulting Group, Inc.
Sarah is originally from Markesan, Wisconsin, and came to Minnesota via college. She graduated from the University of Minnesota and joined SRF two years ago. 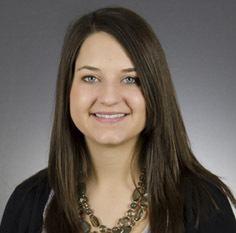 Prior to working at SRF, Sarah interned with the City of Minneapolis and City of Minnetonka. One of the most exciting projects Sarah has had a chance to work on was the Blue Line Light Rail Transit project since she can see the lon- range benefits it will have for so many people in the area. On the weekends, you might find Sarah exploring the metro for new shops and restaurants, or just at home in St. Louis Park doing puzzles with her husband. Her favorite restaurant is Chipotle. Her favorite vacation to-date was a trip to Papua New Guinea. Her spirit animal is a cat, because she tends to gravitate to warm sun spots. If she ever started a new career she would be a zoologist, because then she could spend every day at the zoo. Thanks for sharing a little bit about yourself, Sarah!